The Bhut Jolokia (or Naga Jolokia), know here as the “ghost chili”, made The Guinness Book of World Records in 2007 as the hottest pepper on earth. It was rated at 1,001,304 Scoville units in 2005, at the New Mexico State University Chili Pepper Institute! 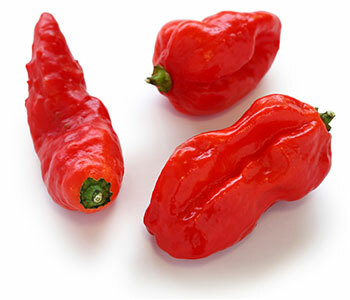 However, it seems to have a range, depending on where it is grown, as Manipur University in India measured Bhut Jolokias grown there and gave them a rating of “only” 329,100 Scoville units. For comparison, habaneros are rated between 100,000 and 350,000–and tabasco sauce is rated between 2,500 and 5,000. Either way, this pepper is RED HOT! (Check out the Scoville Chart). Most grow from green to red (hottest at red), though some varieties mature at yellow or orange. Considering its heat, we would not recommend this as an ornamental pepper, not a pepper to pop in your mouth, unless you REALLY know what you are doing with peppers. In India, the peppers are used to keep wild elephants at a distance…definitely a pepper to be cautious with. As with most peppers, these like warm soil (70-90 degrees F) to germinate, need a good fertile soil, somewhat moist–do not overwater or they will grow spindly. Seedlings should be gradually conditioned to the outdoors for about a week before being set into the garden. They prefer morning sun with some shade during the day, especially in warmer areas. If growing them in pots, use a well drained soil mix. Use a reduced nitrogen fertilizer once blooming starts, such as Gro Power® Flower N’ Bloome 3-12-12 or they may not set pods. Also, if the air temperature gets over 90 degrees, try to get them some shade (like other peppers and tomatoes, they don’t set fruit in very hot weather). Ornamental or edible, growing a pepper that has made the Guinness Book of World Records gives some undeniable bragging rights!